Find hotel near Li Qun Roast Duck Restaur ..
Li Qun Roast Duck Restaurant is one of the best places to get a bite in the city. So if you are someone who is looking for great food at a great price then the restaurant is a must visit for you. The staff is friendly and the food is fresh and tasty. The place is good to have lunch or dinner at as they serve some of the best delicacies in the city. Take a bus from Justice Road. How popular is Li Qun Roast Duck Restaurant? People normally club together Altar Of The Sun and Dongyue Temple while planning their visit to Li Qun Roast Duck Restaurant. I was staying in a hotel quite nearby, so when I went to the concierge to get help making a table reservation for another famous roast duck chain, the staff actually eagerly recommended this place instead. I was sold when I was told that the restaurant was situated in a traditional house, and the prices was a lot more wallet friendly than the other place i wanted. The decor of Li Qun is definitely very different from what I could have imagined. 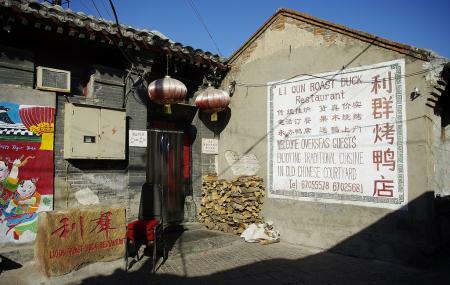 If you go about in Beijing, especially on a hutong tour, the restaurant is situated in one of those buildings! I found it to be really cool since it is so different, and gives a certain homely feel. Staff were nice, friendly and attentive, and the menu had English, so it helps tremendously. Food wise, I think the hotel staff severely oversold it, and raised the bar way too high, so it didn't quite meet the expectations. Not that it is not nice, just not great enough to match how it was portrayed. That being said, I would not mind going back, especially if with people that have not visited before. Local place, the duck is really good! such an experience. You will have to wait like 20-30 min but the dinner worth it! Price around 20€ person. Very bad service. Did not receive what we ordered but got overcharged significantly. The duck was not what was advertised and tasted blant. We received less than 1/3 of the meat from the duck.